"Manage Users & Permissions" gives you extensive control over user accounts, and is accessed via the MIDAS Admin Options icon. Use this function to add/remove users, and to control which MIDAS features each user has access to. Active Directory integration can also be enabled and configured from this screen. Users - From this tab you can add a new user, remove an existing user, or modify an existing user's details or permissions. Groups - For this tab you can define a new a new user group, remove an existing user group, or modify the permissions on an existing group. On the "Users" tab, click/tap the "Add New User" button. You can then proceed to add details for the new user. Enter the new user's full name and e-mail address in the "User Settings" area - it is important to enter a valid email address, as the user will require this if they need to reset a lost/forgotten password. Enter a "password" for the user, or use the "Random" button to automatically generate a random password. If you would like MIDAS to automatically e-mail the new user their login and MIDAS access details, ensure that the "Auto send User their Login details via email" option is checked. If the "User must change password on next login" option is selected, next time the user logs in to MIDAS, they will be prompted to change their password - It is recommended that this option is selected, especially if you have generated a "random" password for that user, which will be difficult to remember. Manually set "permissions" (privileges) for the user from the list of available "User Permissions", or use the "Assign Permissions From Group" drop-down to use current permissions from an existing user group. Select "Save Changes" when complete to add the user to MIDAS. On the "Users" tab, select an existing user whose permissions you wish to "clone" (Create a New User based on the User Permissions of another user). Select the "Add New User" button. The "User Settings" area will be cleared allowing you to add details for the new user. The rest of the "permissions" (privileges) will have remained from the previously selected user. You may adjust these for your new user accordingly. Select "Save Changes" when complete to add the new user to MIDAS. On the "Users" tab, select the user you wish to modify from the list of users. The selected user's settings and permissions will then be displayed. Make changes to the user's settings/permissions as necessary and select "Save Changes" when done. On the "Users" tab, select the user you wish to delete from MIDAS from the left-hand list of current users, and then click/tap the "Remove Selected User" button. If you have enabled Single Sign-On (Active Directory) authentication, removing a user will only be temporary - the next time that user authenticates, they will be added back to MIDAS. In such instances, "Suspending" the user (via the "Account is Suspended" option) rather than removing them, will revoke their access. Users can change their own password at any time using the [Change Password] link at the top of the screen when logged in. Administrators can also change/reset a user's password for them (via MIDAS Admin Options → Manage Users & Permissions → [select user]), by entering a new password for the user (or selecting the "Random" button to generate an random password), and then clicking/tapping "Save Changes". Select the user who you wish to force to change their password upon their next login from the left-hand list of current users. The selected user's details and permissions will be displayed to the right. Select the "User must change their password on next login" option, without altering any other settings, then select "Save Changes". 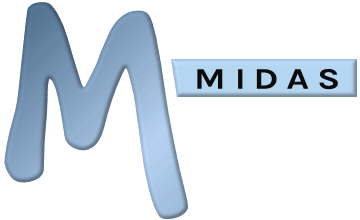 The user will then be prompted to change their password the next time they login to MIDAS. Tick the "Account is suspended" to prevent the user from logging in. Untick the "Account is suspended" to allow the user to log in. "User Groups" allow you to define a set of permissions that can then be easily applied to individual user accounts. This saves you from having to manually define each permission for each user at a time. Instead, the "Apply Permissions from Group" drop-down list on the "Users" tab will allow you to quickly update the selected user's permissions with the permissions assigned to a particular user group. In addition, if you have enabled Single Sign-On (Active Directory) authentication for your MIDAS, User Groups are used to determine the permissions assigned to each user who authenticates via your Active Directory. In such instances, MIDAS user permissions will be assigned from a MIDAS User Group with the same corresponding name as the user's "Primary Group" name in your Active Directory. For more information, please refer to the separate Active Directory Integration documentation. Can make Historical Bookings Allow/Deny the user the ability to add bookings for dates earlier than the current date (i.e. in the past) - useful for maintaining accurate booking records. Can book outside Operating Hours Allow/Deny the user the ability to make bookings which fall outside the normal "Operating Hours" of each venue. No - User cannot see who has made a booking, only that a venue is "Unavailable"
Can process Booking Requests Allow/Deny the user access to "Pending Booking Requests" to approve/reject incoming booking requests. If present, the Single Sign-On (SSO) tab of the "Manage Users & Permissions" screen allows you to enable and configure integration with an Active Directory, allowing users to seamlessly login to MIDAS without having to enter credentials each time.